If you have ever visited Melange apothecary, you may have noticed the glass apothecary jar full of large crystals and asked "what are these?" For those who are curious, and those who have tried (and now LOVE) these wonderful little crystals the answer is -- Brazilian Sea Salt Crystals. While our initial attraction to them may be their unique appearance, what really makes them wonderful is what they do. Native to Brazil, these natural, solar evaporated sea crystals are rich in minerals and offer a therapeutic, time released relaxation benefit in the bath. I never take a salsa class or engage in a high-intensity workout without a few to place in the bath to help ease my tired muscles. Rosemary, Orange Blossom, Lavender and Green Tea are my favorite fragrances in the salts. They also work well when scented with essential oils in the shower -- Eucalyptus & Lavender for example. The crystals work with the steam in the shower to release the essential oils and can help to ease congestion and allergy symptoms. Last, the crystals can be scented and placed in a dish to fragrance your environment. 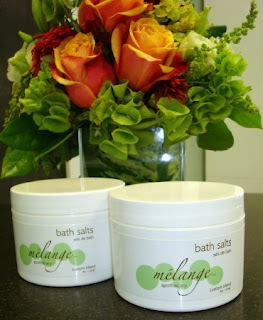 For information on Brazilian Sea Salt Crystals visit the Salt & Scrub section of our site http://www.melangeapothecary.com/ or the Melange Apothecary retail store. Brazilian Sea Salt Crystals: $18 made to order. 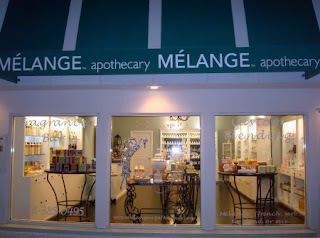 Melange has only two sales a year. This is a perfect way to treat yourself or get an early start on Holiday gifts with 30-60% off on some of the world's finest bath, body and home fragrance products. 30-50% Off on MOR body products, selected Cote Bastide France, Gianna Rose Atelier, Tsi-La Organic perfumes, Gianna Rose atelier, Abahna London, Thymes, Bluewick Candles, 100% Pure bath salts and scrubs and more! All sales are final. Selected sale items are also available on our website.